Palestinians has remained unconcerned following US President Donald Trump’s plans to cut off aid to Palestinians for their intransigence not to engage in talks with Israel under the US auspices. “We will not be blackmailed,” Hanan Ashrawi said in a statement. “President Trump has sabotaged our search for peace, freedom and justice. Now he dares to blame the Palestinians for the consequences of his own irresponsible actions!” she added. 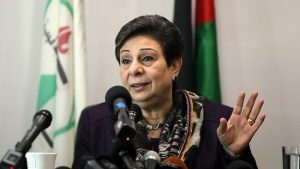 Ashrawi’s comments followed Trump’s Tuesday threats to halt payment of $300 million to Palestinians making US financial assistance to Palestinian authority (PA) in Ramallah. The US president on Tweeter wondered why the United States should continue allocating massive money if Palestinians refuse to sit with Israel for new peace initiatives. “But with the Palestinians no longer willing to talk peace,” he wrote. Palestinians have rejected any US-sponsored peace initiative arguing that the White House has lost credibility after President Trump December 6 declared Jerusalem capital of Israel. The US decision which also announced the transfer of the American embassy to the old city distorted decades of US foreign policy in the region. Trump said he had planned for Israel “to pay” in future negotiations for his declaration. He also added that Jerusalem will not be part of the talks and for that Israel ‘would have had to pay more. It is unclear what Palestinians will receive in return. Trump’s threats followed those of his UN permanent envoy, Nikki Haley who at the global body indicated that the US would cut its contributions to UN’s Palestinian refugee agency (UNRWA) if Palestinians reject new US-brokered talks. “The Palestinians now have to show their will — they want to come to the table. As of now they are not coming to the table but they ask for aid. We’re not giving the aid,” she said. The US contribution in 2016 was estimated at $368,429,712. Written by: KanelkaTagba on January 3, 2018. Posted by KanelkaTagba on Jan 3 2018. Filed under Headlines, World News. You can follow any responses to this entry through the RSS 2.0. Both comments and pings are currently closed.